The words 'beer' and 'tapas' are music to our ears. And if you throw in a few free concerts and a neighbourhood full of a fun party atmosphere, we're even happier. 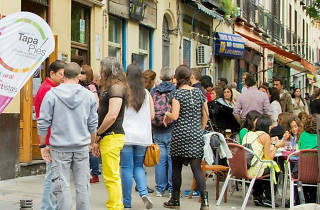 From October 16 to 26, Tapapiés, the most famous tapas route in Madrid, is back with a bang. Few of the locals or visitors in Madrid have never been to one or more of the last three editions, but if you're one of them, you don't know what you've been missing – only Madrid's quintessential gastronomical event of the season! 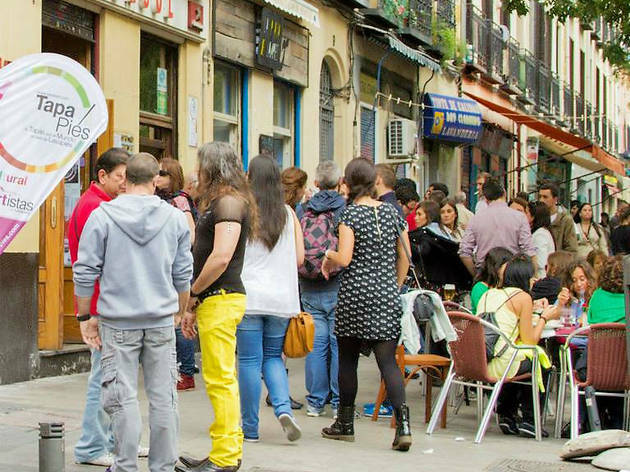 Once again the restaurants of Lavapiés offer up 90 tapas in 60 restaurants and bars, representing cuisine from every continent as well as various regions of Spain. From India to Morocco, you can taste flavours from around the world, and you only have to cover the ground of a few streets. Each tapa costs €1, and you can add a glass or small bottle of Estrella Damm beer for just €1 more. In 2013, music was a fundamental part of this multicultural tapas route, and in 2014 it's even more so. The barrio's streets and squares will host 60 concerts and performances during the weekends of Oct 17-19 and 24-26, from midday into the night. Among others, there will be a 'batucada' drum show with clown touches from Hakuna Ma Samba, and dancing along with the Balkan rhythms of Cuarteto Maravilla and party songs from the novelty duo Potato Omelette Band. There's also street drumming from Dr Bucketman and plenty of circus acts for the whole family from the Indeleble Comunidad Artística. If we have to highlight just two concerts, we recommend the Million Dollar Mercedes Band, a favourite from the previous edition, and the rockabilly trio Lucky Dados. You can vote for the best concert on the Tapapiés Facebook page and be entered to win one of two iPads they're giving away. The top three tapas will also be chosen via social media networks. You'll just have to try them all to be fair.